How does an artist capture and sustain a viewer's interest? Arguably, there are three essential requirements for an artwork to be memorable. The first is that the image must catch a viewer's attention. In literature this is called the “hook" and is usually an intriguing beginning sentence or turn of phrase acting as a metaphorical fishing hook waiting to catch a reader's interest. The second essential requirement is that an artwork must sustain the initial interest. This securing of interest may involve a viewer being drawn into deep contemplation of the artwork by an arrangement of visual devices designed to stimulate the eye and brain to see meaning. Interest may also be sustained by a viewer's reflexive response (i.e. a "gut" reaction) to the imagery in the sense that the artwork triggers a flood of associations and memories riveting a viewer's attention. The third and perhaps the most challenging requirement is that the artwork should leave a viewer feeling conceptually and/or aesthetically satisfied. In achieving this last goal the artwork may have personal significance for the viewer and which resonates with the viewer's mindset. It may also embrace social and cultural issues that are both pertinent and interesting to the viewer. Going even further, it may connect with and add fresh dimensions to the viewer's aesthetic sensitivities and conceptual leanings. For instance, the artwork may excite a viewer's sense of aesthetics in the terms of satisfying a psychological need and it may challenge a viewer's preconceptions about current issues in the visual arts. In short, the pivotal element that makes an artwork memorable is its ability to excite the senses and to challenge expectations. 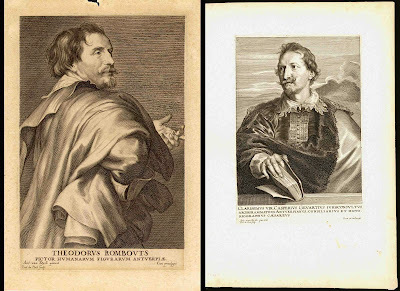 To explain how these three requirements can make an artwork memorable I wish to use as an example an engraving by Paulus Pontius (also known as Du Pont) (1603–1658) after a painting by Anthony van Dyck (1599–1641), Theodorus Rombouts (Théodore Rombouts), 1645. 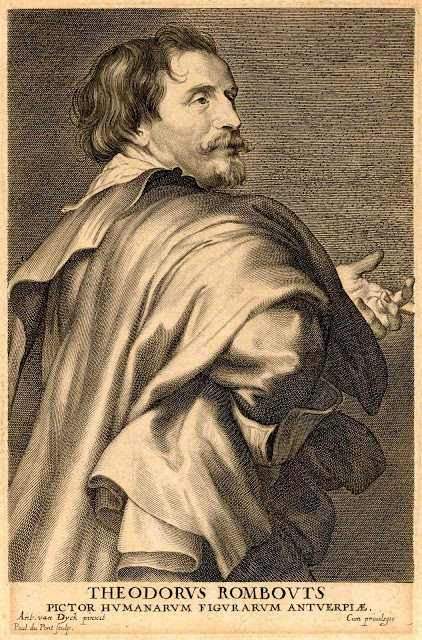 Theodorus Rombouts (Théodore Rombouts), 1645, part of the Iconographie series. Signed in the plate lower left “Ant. van Dyck pinxit” and "Paul du Pont Sculp." Condition: strong impression on laid paper with faint foxing. The sheet is clean with darkening commensurate with the age of this early impression. There is a small area missing in the top margin with a tear extending to the plate mark but not entering into the image. Verso has a pencil inscription and traces of red staining. I am selling this print for $135 AUD including postage and handling to anywhere in the world. Please contact me using the email link at the top of the page if you are interested or click the “Buy Now” button. Regarding the idea that an image should catch a viewer’s attention, Pontius’ choice of a pose for Rombouts is certainly designed to engage with a viewer’s eye and at a visceral level. I envisage that most viewers would interpret the Rombouts’ elbow jutting towards them as psychologically confronting, perhaps even verging on insulting, in terms of socially dismissive and impolite body language. And even if a viewer did not find the pose confronting, the advancing bent arm is visually arresting in the sense that its protuberance creates literally pokes the viewer in the eye. With regard to the requirement that an image should sustain a viewer's interest, this engraving exhibits a very interesting pictorial device employed to invite negotiations of meaning at many different levels: Rombouts' hand gesture that minimally breaks through the right borderline of the print. By virtue of the break in the borderline being so slight, the finger that probes through the borderline functions like a pictorial magnet in attracting the eye to the figure's hand. And, more important, to read the body language that the hand expresses: a gesture to look. The projected meaning of this hand gesture goes beyond the pointing index finger. After all, body language is read from a cluster of different but related gestures. Here, Rombouts’ facial expression suggests that he is momentarily engaged in addressing another person outside the field of vision. This perception is supported by the slight clockwise twist of the face, the alignment of the hand gesture with the direction of Rombouts’ face and the counter movement of the arm on his hip. The relationship of face, hand and arm is not accidental. Clearly the hand, and more specifically the finger, is a fulcrum point in a triangulated relationship where the finger forms a spearhead point of balance (see below). 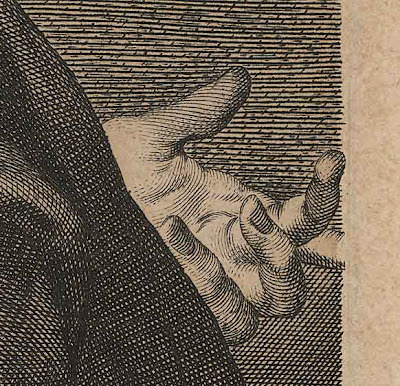 Some viewers will see the focus on the hand with its pointing gesture as signifying that Rombouts is a man of authority. 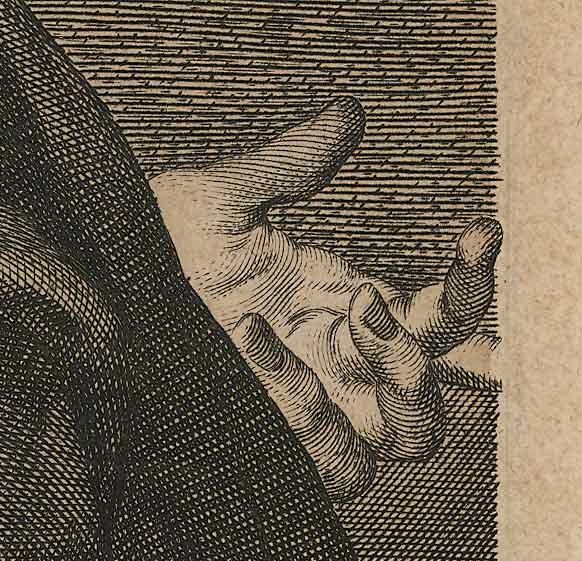 Others may see the direction in which his hand is pointing as indicating that Rombouts is man engaged in abstract discussion (see last post, Saints & Sinners) with his upturned palm revealing an entreaty to non-didactic discourse. From my perspective, I see the relationship of hand, face and bent arm as signifying an insecure man. To my eyes he is portrayed hiding behind a strategically positioned arm and coat with a partly concealed (but pivotally important) hand and averted gaze. Of course, the more one ponders the disposition of the figurer and what may be signified the more interestingly complex the range of readings become. This is the layering of negotiated meanings that a memorable image is able to engender. Regarding the final requirement that an artwork should leave a viewer feeling conceptually and/or aesthetically satisfied, this engraving functions on two levels. Conceptually, the print is memorable for historians as this is one of the few existing portraits of the Flemish painter, Theodorus Rombouts (1597–1637). There is more to this portrait, however, than just being memorable as a rare archival image. For viewers familiar with Rombouts' artworks, they would recognise how this portrait distills Rombouts' mannered gesture in the same Caravaggesque style characterising Rombouts' paintings. For viewers familiar with the Iconographie series of which this portrait is a part, the relation of this print in terms of pictorial and stylistic consistency with the whole collection makes the visual dialogue of comparison a very fruitful engagement. 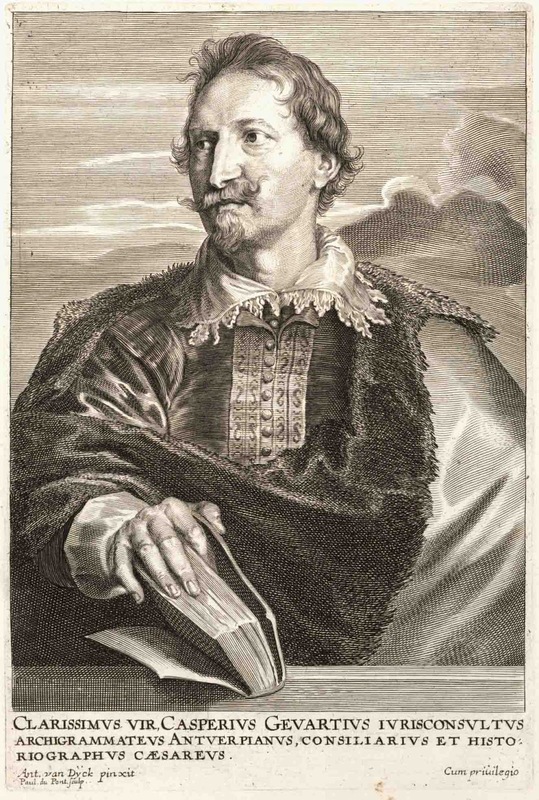 For instance, one could compare the composition and approach to expressing the mindset of Rombouts with that employed in Pontius' engraving (shown below) of the philosopher and writer, Caspar Gevaert (Casperius Gevartius), also a part of the Iconographie series. part of the Iconographie series. Condition: very strong impression with wide margins on laid paper. The sheet is clean with slight darkening at the edges of the sheet commensurate with the ago of the print. There are several marks in the lower right margin with one mark extending 2 mms into the text margin but not entering into the image. Verso has a collector ink stamp and there is a 5mm tear at the bottom of the sheet 8 cms from the plate mark. I am selling this print for $186 AUD including postage and handling to anywhere in the world. Please contact me using the email link at the top of the page if you are interested or click the “Buy Now” button. Aesthetically, close scrutiny of Pontius' precise alignment of contour shading marks is as rewarding as exploring the mystery of nooks and crannies in a landscape. 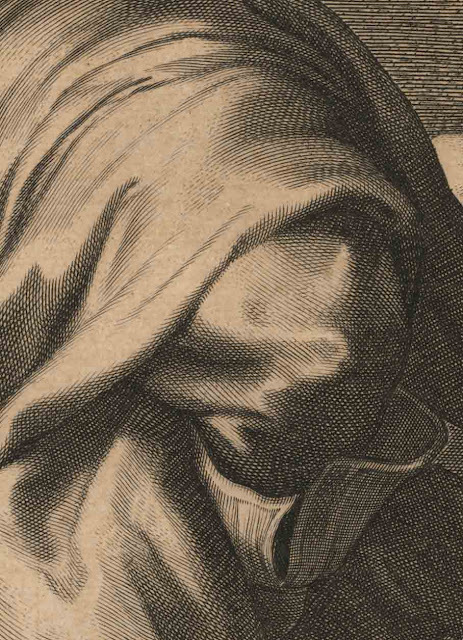 For example, the treatment of Rombouts' cloak (see detail below) is fascinating to contemplate especially how Pontius adjusts the curving lines to describe advancing and receding folds. Even examination of the hatching marks rendering the tone of the background is satisfying. 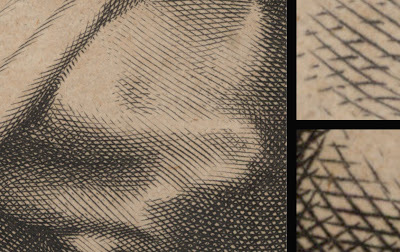 Clearly, Pontius has angled the cross-hatched lines in the upper-left and in the lower-right areas of the background to align with the directional thrust of the figure's back and lower arm. This bias in the marks gives breadth to a viewer’s reading of the many folds in Rombouts’ cloak by simplifying their various angles to one direction. Moreover, Pontius’ use of a single layer of horizontal lines to render the background tone in the upper-right helps to provide an expansive space where a viewer has psychological room to respond to Rombouts’ gaze and hand gesture.